Any individual who is not a citizen or national or lawful permanent resident or specifically authorized to work in the United States cannot be lawfully hired as an employee by any individual, company or agency. Any employer who intentionally hires anyone not authorized to work in the United States violates Public Law 99-603 (Act of 11/6/1986). This law was passed by the U.S. Congress and signed by President Ronald Reagan in order to control and deter unlawful entries into the United States. This law, commonly referred to as amnesty provided for legalization of undocumented immigrants who had been continuously unlawfully residing and working in the United States since 1982, legalization of certain agricultural workers, sanctions for employers who knowingly hire undocumented workers, and increased borders enforcement. Immigration and Custom Enforcement (ICE) conducts workplace enforcement activity to enforce Form I-9 workplace eligibility rules. Violators face civil fines and criminal prosecution and up to six months in federal prison if convicted. 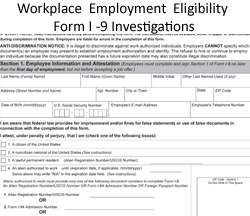 Contact the I-9 Workplace Employment Eligibility Defense Attorney at Coleman Jackson, P.C. online or by calling 214-599-0431.